Rocky Mountain spotted fever, like all rickettsial infections, is classified as a zoonosis. Zoonoses are diseases of animals that can be transmitted to humans. Many zoonotic diseases require a vector (e.g., a mosquito, tick, or mite) in order to be transmitted from the animal host to the human host. 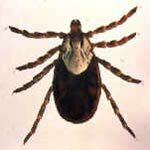 In the case of Rocky Mountain spotted fever, ticks are the natural hosts, serving as both reservoirs and vectors of R. rickettsii. Ticks transmit the organism to vertebrates primarily by their bite. Less commonly, infections may occur following exposure to crushed tick tissues, fluids, or feces. Only members of the tick family Ixodidae (hard ticks) are naturally infected with Rickettsia rickettsii. These ticks have four stages in their life cycle: egg, larva, nymph, and adult. After the eggs hatch, each stage must feed once to develop into the next stage. Both male and female ticks will bite. A female tick can transmit R. rickettsii to her eggs in a process called transovarial transmission. Ticks can also become infected with R. rickettsii while feeding on blood from the host in either the larval or nymphal stage. After the tick develops into the next stage, R. rickettsii may be transmitted to the second host during the feeding process. Furthermore, male ticks may transfer R. rickettsii to female ticks through body fluids or spermatazoa during mating. In this manner, generations or each life stage of infected ticks are maintained. Once infected, the tick can carry the rickettsiae for life. Rickettsiae are transmitted to a vertebrate host through saliva while a tick is feeding. It usually takes several hours of attachment and feeding before the rickettsiae are transmitted to the host. The risk of exposure to a tick carrying R. rickettsii is low. Generally, about 1 -3% of the tick population carries R. rickettsii, even in areas where the majority of human cases are reported. There are two major vectors of R. rickettsii in the United States, the American dog tick and the Rocky Mountain wood tick. 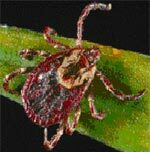 The American dog tick (Dermacentor variabilis) is widely distributed east of the Rocky Mountains and also occurs in limited areas along the Pacific Coast. Dogs and medium-sized mammals are the preferred hosts of adult D. variabilis, although it feeds on other large mammals, including humans. This tick is the most commonly identified species responsible for transmitting R. rickettsii to humans. The Rocky Mountain wood tick (Dermacentor andersoni) is found in the Rocky Mountain states and in southwestern Canada. The life cycle of this tick may require up to 2 to 3 years for completion. Adult ticks feed primarily on large mammals. Larvae and nymphs feed on small rodents. Other tick species have been shown to be naturally infected with R. rickettsii, but these species are likely to play only a minor role in the ecology of R. rickettsii.